This is the Bahamas 3-day public forecast for today and tonight Thursday 25th April 2019. NEWS ITEM ON HURRICANE LESLIE ISSUED BY THE BAHAMAS DEPARTMENT OF METEOROLOGY FORECAST OFFICE SECTION, AT 6PM FRIDAY 12TH OCTOBER 2018. NEWS ITEM ON TROPICAL STORM NADINE ISSUED BY THE BAHAMAS DEPARTMENT OF METEOROLOGY FORECAST OFFICE SECTION, AT 6PM FRIDAY 12TH OCTOBER 2018. NEWS ITEM ON SUBTROPICAL STORM LESLIE ISSUED BY THE BAHAMAS DEPARTMENT OF METEOROLOGY FORECAST OFFICE SECTION, AT 6AM MONDAY 24TH SEPTEMBER 2018. NEWS ITEM ON TROPICAL DEPRESSION KIRK ISSUED BY THE BAHAMAS DEPARTMENT OF METEOROLOGY FORECAST OFFICE SECTION, AT 6AM MONDAY 24TH SEPTEMBER 2018. NEWS ITEM ON HURRICANE FLORENCE ISSUED BY THE BAHAMAS DEPARTMENT OF METEOROLOGY FORECAST OFFICE SECTION, AT 12PM THURSDAY 06TH SEPTEMBER 2018. NEWS ITEM ON TROPICAL STORM FLORENCE ISSUED BY THE BAHAMAS DEPARTMENT OF METEOROLOGY FORECAST OFFICE SECTION, AT 12PM SATURDAY 01ST SEPTEMBER 2018. 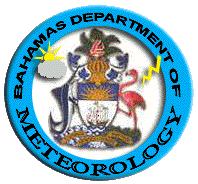 THE BAHAMAS DEPARTMENT OF METEOROLOGY HAS ISSUED A SEVERE THUNDERSTORM WARNING FROM 12:20AM EDT UNTIL 5:20AM TUESDAY 3RD OCTOBER 2017. A SEVERE THUNDERSTORM WARNING IS IN EFFECT FOR ABACO AND ITS ADJACENT WATERS. 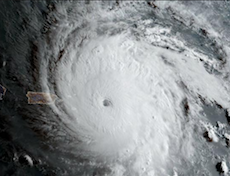 The Bahamas Department of Meteorology has issued a Hurricane Watch for the Southeast Bahamas and the Turks and Caicos Islands, as the dangerous Hurricane Maria eyes those islands, which were already impacted by Hurricane Irma a week ago. ISSUED BY THE BAHAMAS DEPARTMENT OF METEOROLOGY TUESDAY 19TH SEPTEMBER, 2017 AT 12 NOON EDT. 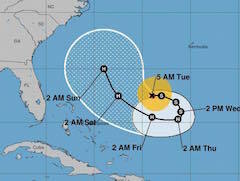 The National Hurricane Centre is advising that based on its latest models, when Hurricane Jose completes it loop on Friday, September 15, 2017, it will be pointed more towards the Carolinas and Virginia, USA. 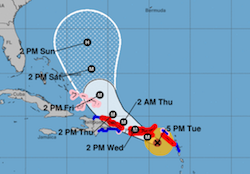 This suggests that Hurricane Jose will pose much less of a threat to The Bahamas and the Turks and Caicos Islands this coming weekend or early next week. 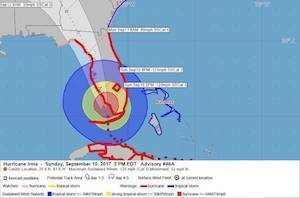 Tropical storm warnings for Grand Bahama and Bimini have been discontinued, hence the All Clear has been given for those islands which experienced dangerous Hurricane Irma over the weekend. Bahamian meteorologist and hurricane book author, Wayne Neely gives his explanation about the receding water around Long Island, Acklins and Exuma in light of Hurricane Irma. Tropical Storm Warnings Remain In Effect For Grand Bahama And Bimini. A Tropical Storm Warning Means That Tropical Storm Conditions Are Affecting Or Can Affect The Aforementioned Areas Within 36 Hours. 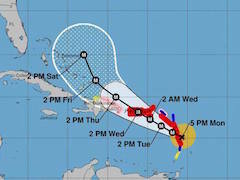 At 2pm Edt, The Center Of Hurricane Irma Was Located Near Latitude 25.6 Degrees North And Longitude 81.8 Degrees West Or About 167 Miles West Of South Bimini, 197 Miles West-southwest Of West End Grand Bahama, 273 Miles West Of New Providence. 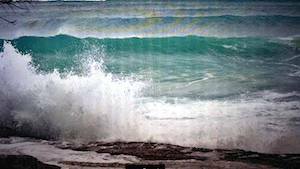 The Combination Of Storm Surge And Large Waves Can Raise Water..
News Item On Hurricane Jose Issued By The Bahamas Department Of Meteorology Forecast Office Section, At 6pm Saturday 09th September 2017. At 5:00pm Edt, The Center Of Hurricane Jose Was Located Near Latitude 19.2° North And Longitude 62.4° West Or About 85 Miles Norh-Northeast Of The Northern Leeward Islands. Bahamasair wishes to advise the traveling public that we will resume limited operations on Sunday, September 10th 2017. It is our expectation, that we will resume services after 1:00pm into Freeport, Marsh Harbour, Rock Sound and Georgetown Exuma provided that the “ALL CLEAR” is given by the relevant authorities.